Based on the Biblical account of the widow’s mite (Luke 21:1–4), the Mite Box is intended for regular contributions of “mites” — offerings above and beyond the support given to congregations and the LCMS. Mite Box contributions amount to millions of dollars that fund district and national mission grants and implement the LWML program. 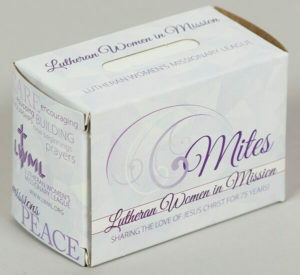 Mite Boxes, available from the district, zone, or LWML office, are distributed to every woman in a society, and often to each member of the congregation. Local groups submit Mite Box offerings to the appointed district officer. Over the years, many Lutheran Ladies Aid societies used a box to gather funds in support of local and synod ministries. Under the original 1928 Lutheran Women’s Missionary Endeavor organizational plan, each woman in every congregation would receive a Mite Box if she participated in the Ladies Aid. Receipts from the 92 Ladies Aid societies totalled $6651.31 in 1930. The Lutheran Women’s Missionary League, formally recognized by the Lutheran Church—Missouri Synod in 1942, required by the newly adopted constitution and bylaws, that 25% of all missionary contributions be given to the national organization, shared from the districts. Please post a note if this donation is for a memorial or in honor of someone. Please type in your amount in the field above. Once you click the Donate button, you will be taken to PayPal, where you will complete your donation via a secure payment. Thank you for supporting LWMLNID with your kind donation. We appreciate your generosity. Your contribution helps us provide the services we offer through LWMLNID.